So…the footie team excursion to Cologne aka two and a half day drinking binge came to a close yesterday evening. 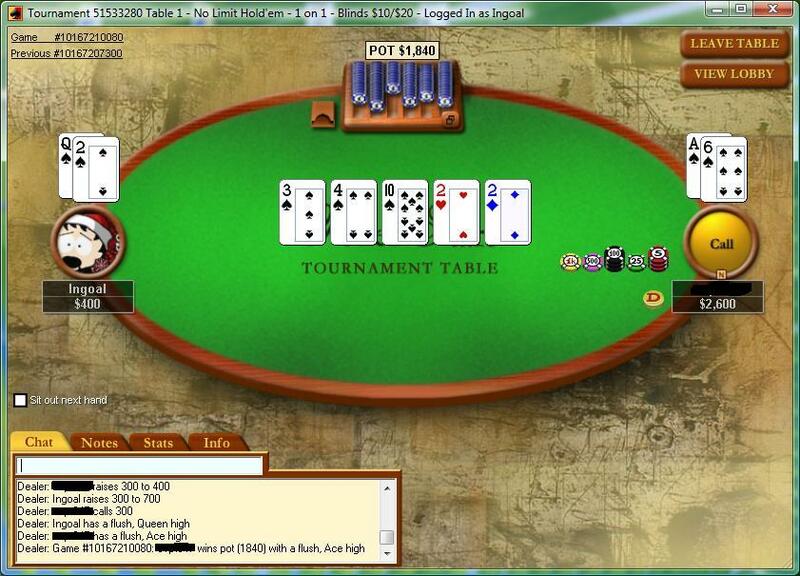 As I was still on the “staying up late” rhythm, I played a few SnGs before hitting the mattress, 2W 1L in three HU SnGs. While this was the best one, there were numerous other (less coolery) hands that just had me on the “second best” side at all times (A10 vs AJ, AQ vs AK, A4 vs A7 – lovely to have all those hands with the same theme: Ace hitting the flop and either both kickers hitting or the other dudes kicker playing, so fugly; straights vs flushes with the river card; counterfeited two pair, etc etc). I decided to play one more to round out the 10 matches and I won that one when I finally hit my first cooler of the session. I rivered the flush which gave my opponent the nut straight. Teehee. After that one I decided to jump into some shorthanded SnG action and took down second. We started HU with me being down about 3:2 and my opponent did a great job leaning on me at all times. I couldn’t do much about it with my monster 9-, 8- or 7-highs…and when I finally had a face card (K9 s00ted) he had an Ace and it stood up…ce la vie. 1. At least some opponents can laydown second or third pair. 2. At least some opponents can even laydown TPxK on a scary board.